The Belgian metal construction company Geldof of Harelbeke has reeled in a project for the construction of 23 storage tanks in the port of Amsterdam, good for something like 620,000 m³ of storage capacity. The value of the contract for this huge project will not be published. 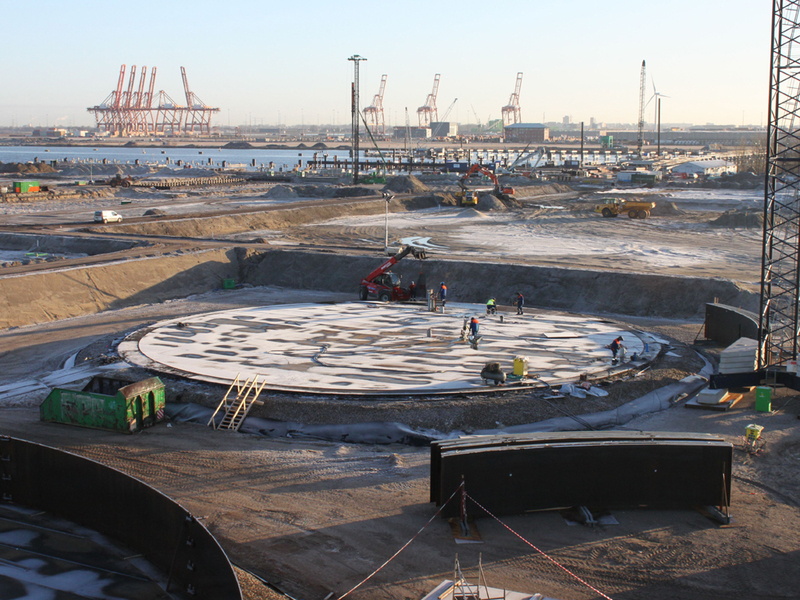 This project for tank terminal operator Vopak is unique in Western Europe. In total, 23 fuel tanks will be built in the Amsterdam Westpoort port. The largest tanks, with a capacity of 40,000 m³ have a diameter of 48 meters and cover an area the size of 9 tennis courts. The smallest tanks, still good for 2,000 m³, have a diameter of 13 meters. The heights vary from 15 to 22 meters. The total storage volume amounts to 620,000 m³. For this project, Geldof entered in to a partnership with Koninklijke BAM Groep B.V., the most important player in civil engineering in the Netherlands. They will be responsible for the superstructure of the two new jetties for ships, transhipment machinery, foundations and other civil engineering infrastructure. “This budget will not immediately lead to new recruiting,” says CEO Rudy Platteau. “However, it does mean that we can offer our employees job security for the next 2 years. Which in these difficult economic times is positive news.” The flame cutting, rolling, steel blasting, painting and finishing of the giant steel components will be done at the Geldof company location in Harelbeke. The tanks will be welded on site. “We consciously made the decision to keep the production here, that way we can complete this project with our regular, trusted team,” adds Marc Meurisse. The last tanks will be delivered in the first half of 2011. According to the provisional estimates, 8,500 tons of steel will be needed for the planned tanks. Another remarkable fact is that the tanks have a double roof: a fixed roof and an aluminium floating inner roof. Combined with special sealing techniques, they can optimally store volatile substances such as diesel and other fuels and the emissions of gases and fumes are kept to a minimum. Bringing in this budget is a major step in the history of Geldof. Where in former times the company mainly focused on the manufacture of tanks, it now wants to offer customers complete solutions. Geldof can fulfil that total management commitment because it has both its own engineering department, and a strongly developed operational department that is adapted to this type of large scale project. Thanks to this project, Geldof has grown further into an important reference in its sector for Western Europe and beyond. Winning this budget is not only an enormous stimulus for the company, but for the whole Belgian economy in this time of crisis.